There’s really nothing better than the feeling I get after cleaning out my closet. I love opening the door to an organized closet and seeing actual space between the hangers. It really gives me a sense of accomplishment. The only question is what to do with the piles of clothing and accessories that I’m no longer keeping? Enter Klury.com. The Phoenix-based online retailer specializes in the buying and selling of high-end designer fashion and accessories. The process is super simple: fill out a form and submit a photo of the item and within 24 hours Klury.com will make you an offer. Once you accept the offer, you simply print out the pre-paid shipping form and drop your item off at the USPS office. That’s it. Quick and easy. It sure beats spending time uploading photos to eBay or waiting out the 90 days at the consignment store. Oh, and if you’re looking to fill some of that extra space you have after your closet clean out, Klury.com can help with that too. 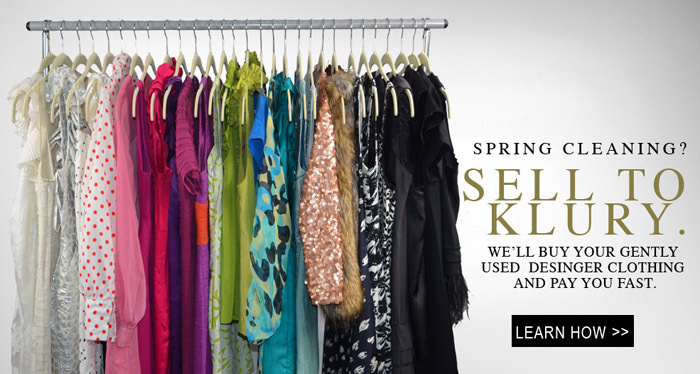 Check out their selection of gently used items at budget friendly prices. What a great site! Thanks for letting us know about it. I donate items several times a year and am so glad to know I have this option! Great idea for a site. There are a few of these now and I always forget the names of them, so I'll be sure to mark this down. I'm in the process of cleaning out my closet, so such great timing!